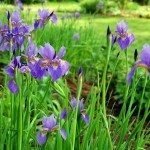 When my Siberian irises bloom the flowers are halfway down inside the leaves. Why does it do that? Lack of sunlight can be a cause of stunted growth as well as soil, water, nutrients and pests and insects. Stunted growth could also be a sign that your plants should be divided. Use these links to help pinpoint the issue.